This week, the Rotary Club of Washington, DC, welcomed guest speaker Dr. Unique Morris-Hughes, Director of The Washington, D.C., Department of Employment Services. Development Director, BEST Kids, Inc.
Acting Sergeant-at-Arms Bob Schott then announced the birthdays and anniversaries. The guest speaker was introduced, Dr. Unique Morris-Hughes, Director of The Washington, D.C., Department of Employment Services (DOES). In her role as State Labor Commissioner, she is directly responsible for more than $150M in local, federal, and specific-purpose funds administered by the District of Columbia and the federal government for workforce development programs and training, unemployment compensation, universal paid leave administration, and labor standards enforcement along with more than $80M in active capital projects. Previously, Dr. Morris-Hughes was the Chief Strategy Officer for DOES. Dr. Morris-Hughes was also OSSE’s Chief Operating Officer, leading numerous management functions in support of the agency’s mission, including a $270 million education grant portfolio and $600 million in student-per-pupil funding. She also provided oversight of several departmental units, namely Grants Management, Facilities, Operations, Contracting and Procurement and Student Enrollment, Funding, and Residency. In addition, Dr. Morris-Hughes served as OSSE’s acting Assistant Superintendent of Wellness and Nutrition. Dr. Morris-Hughes’ career spans for-profit and nonprofit sectors. She has several years of experience in education, program development, evaluation, and compliance. She previously served as Assistant Head of School at Septima Clark Public Charter School, the District’s first all-boys charter school. 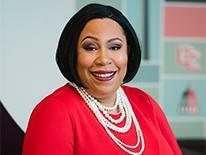 Her other appointments include: Center Director for the District of Columbia Public Schools; District Director of Programs for Junior Achievement of the National Capital Area; Coordinator of Public Policy for Amazon.com; and Adjunct Professor at Trinity University and at the U.S. Department of Agriculture’s Graduate School.